A 40 percent chance of showers and thunderstorms. Mostly cloudy, with a high near 90. East wind around 5 mph. 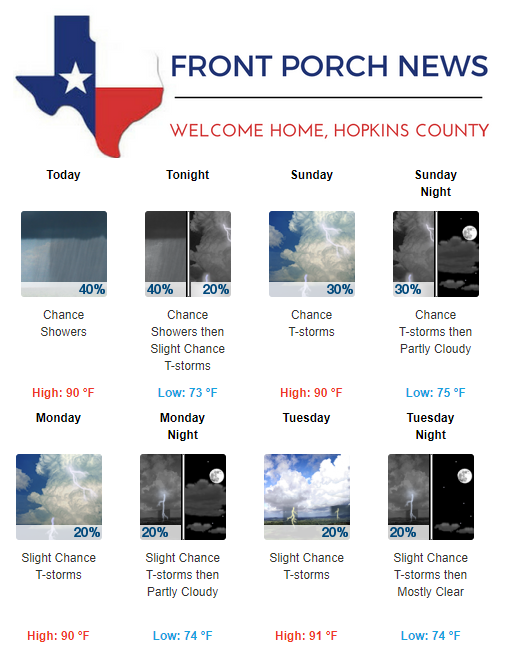 A 40 percent chance of showers and thunderstorms, mainly before 8pm. Mostly cloudy, with a low around 73. Northeast wind around 5 mph. A 30 percent chance of showers and thunderstorms, mainly after 2pm. Partly sunny, with a high near 90. Northeast wind around 5 mph becoming calm. A 30 percent chance of showers and thunderstorms before 8pm. Mostly cloudy, with a low around 75. North northeast wind around 5 mph becoming calm. A 20 percent chance of showers and thunderstorms after 8am. Partly sunny, with a high near 90. Calm wind. A 20 percent chance of showers and thunderstorms before 8pm. Partly cloudy, with a low around 74. South wind around 5 mph becoming calm. A 20 percent chance of showers and thunderstorms after 8am. Mostly sunny, with a high near 91. Calm wind becoming south southwest around 5 mph. A 20 percent chance of showers and thunderstorms after 8am. Mostly sunny, with a high near 93. Calm wind becoming south around 5 mph in the afternoon. A 20 percent chance of showers and thunderstorms before 8pm. Partly cloudy, with a low around 75.